Increasing numbers of companies are becoming active in the drone sector. The last few years have seen the development of a real market that provides a diverse range of platforms with specific applications. And the sector is constantly becoming more professional. While projects initially focused primarily on the film and photographic sectors, applications are increasingly making inroads into the particular technologies. The trend of the last few years is clear – a constantly growing number of companies have established themselves in the drone market as manufacturers or professional users. Other companies are continually entering the sector and becoming active as manufacturers of hardware and software solutions, for example, or as professional users with drone services. The market offering encompasses the manufacture (of hardware and software) and use of drones as an efficient tool for specific applications, end-to-end solutions, and services such as drone-as-a-service. These all harness the multitude of possibilities offered by drone technology to generate genuine added economic value for customers. Surveying and building inspections, for example, can thus be performed quickly, easily and cost-effectively, because scaffolding, building climbers and the intensive deployment of personnel on site for days on end are no longer required, unlike in conventional processes. The density of the data captured is also far greater, while the outlay is lower overall. What’s more, drones can now do all this in a much shorter timeframe. However, the European drone industry still has huge potential. At the present time, this doesn’t so much apply to the drone platform itself but rather the growing application options made possible by larger loads and longer flying times. As a result, for instance, more sensors can be used on drones, gathering even more data and even more precise data. Many potential customers who could use drone technologies to make their workflows much more efficient still have no precise idea about the wide range of possibilities offered by the drone market for the actual working environment. However, there are also challenges. The regulatory framework still does not reflect what has long been technologically possible using drones. Among other things, flying out of sight is not permitted. Companies are often put off by the complex ordering procedures. Orders where drones are to be used at very short notice often fail due to the weeks taken to process applications for flight permits from the relevant authority. Nevertheless, within the means available, the sector is implementing an increasing number of projects in which drones play a key role. Yet the image of drones among the general public often differs. Apart from being perceived as a toy, they often only make the headlines as a threat to air traffic or as a pizza delivery service. But the reality of professional drone use is completely different and occurs mostly beyond the public gaze. A recent industry survey gives an insight into the commercial market for unmanned flights: The industry barometer was carried out using the ‘explori’ survey platform on behalf of INTERAERIAL SOLUTIONS and sheds real light on the European drone industry and the issues of those involved. It highlights challenges but also a very clear trend towards growth and professionalization. Learn more about the European drone industry in the report. 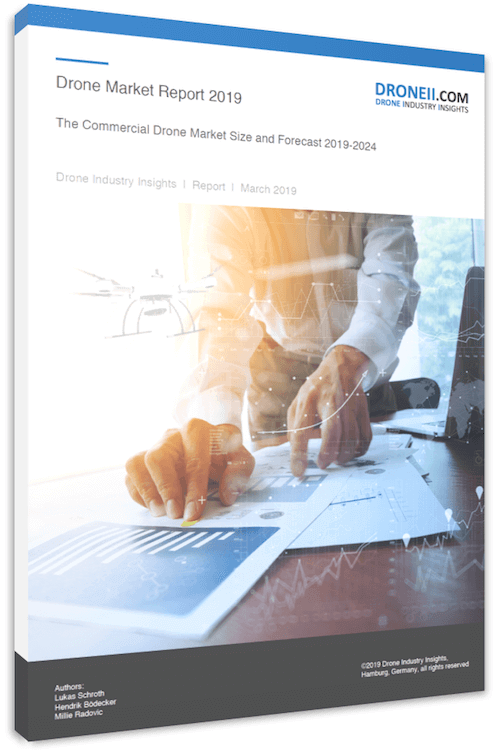 Drone Industry Barometer 2018 – Download the free report now and join our frequent newsletter service. Lukas holds a degree in Aerospace Engineering as well as a Masters in International Business Administration and Engineering. During his education he was involved several consulting and process optimization projects at MTU Aero Engines AG. At DRONEII he’s the go to voice on drones and AI. Lukas holds a degree in Aerospace Engineering as well as a Masters in International Business Administration and Engineering. During his education he was involved several consulting and process optimization projects at MTU Aero Engines AG. At DRONEII he's the go to voice on drones and AI.